Elton John, Bruno Mars, Meryl Streep and others have a ball singing songs you wouldn't expect as Channing and Jenna Dewan Tatum torridly tango. Imagine The Wizard of Oz starring Meryl Streep as Dorothy, James Taylor as the Scarecrow, Sting as the Tin Man and Elton John as the Cowardly Lion. Well, thanks to the Rainforest Fund benefit concert, you don't have to anymore. The show's surreal opening number featured that (noncostumed) all-star cast warbling 'If I Only Had a Brain', and it was only the beginning. These annual Carnegie Hall shows organized by Sting and his wife Trudie Styler always are a highlight of the musical year. They usually follow the concept of stars singing songs they've never done before and likely will never do again, thereby providing strong incentive for attendees to part with serious cash for the ultra-pricey tickets. This year's edition, Songs From the Silver Screen, was a typical delight. Along with the Oz team, it featured Jennifer Hudson, Bruno Mars, Vince Gill, Rosanne Cash, Bryn Terfel and Rita Wilson, with Channing and Jenna Dewan Tatum offering dance support. The fun comes from seeing the performers step out of their comfort zones: Sir Elton warbling 'Moon River', Sting crooning 'Singin' in the Rain', Taylor singing 'Shall We Dance?' from The King and I before proceeding to do just that with Wilson, opera star Terfel bellowing an Argentine-flavored 'Roxanne' in stentorian tones as the Tatums torridly tangoed on the sidelines. Streep, whose musical credits range from Broadway to ABBA on the big screen, charmingly sang 'When You Wish Upon a Star' and duetted with Sting on a playful 'Let's Call the Whole Thing Off'. Cash did a sultry 'Ode to Billie Joe' and a moving 'Everybody's Talkin'.' Hudson reprised her signature Dreamgirls number 'And I Am Telling You I'm Not Going'. Gill harmonized with Wilson on a sweet 'All I Have to Do Is Dream'. Terfel delivered a seeming audition for a Man of La Mancha revival with a booming 'The Impossible Dream'. And Sting, accompanied by bassist Esperanza Spalding, did a jazzy 'Be-Bop-A-Lula'. Mars got some of the biggest cheers of the evening, first for his soaring duet with John on 'Unchained Melody' and again for his hip-swiveling 'Jailhouse Rock'. Not everything worked. Taylor, who seems temperamentally unsuited for the angst of 'Ol' Man River', somehow managed to turn it into a feel-good song. On the other hand, John, informing the crowd that ''It has become a custom at these shows for me to humiliate myself,'' good-naturedly fulfilled his mandate by singing 'Diamonds Are a Girl's Best Friend' while waving his rock-covered digits and bumping and grinding with Channing Tatum. ''Well, I guess I can cross that off the bucket list,'' declared Gill, who unfortunately had to go on next. President Clinton, a seemingly ubiquitous figure at such events, delivered a speech about the global environmental crisis. On a more lighthearted note, he pointed out, ''I'm the only person in the audience old enough to remember the original version of every tune done here.'' But that didn't prevent him from misidentifying the composer of 'Be-Bop-A-Lula' as Gene Pitney instead of Gene Vincent. Is this available on any media for purchase? Jennifer Hudson and Bruno Mars have been added to the incredible lineup for the upcoming Revlon Concert for the Rainforest Fund! 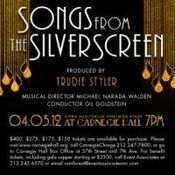 They join an all-star list of performers including Sting, Elton John, James Taylor, Meryl Streep, Vince Gill, Rosanne Cash, and Bryn Terfel at the concert on April 3, 2012, which will be held at the world-renowned Carnegie Hall's Stern Auditorium/Perelman Stage, followed by a gala dinner.